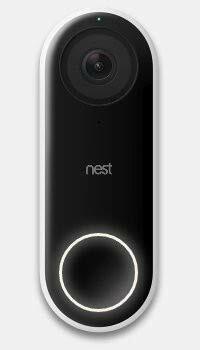 The Nest Hello video doorbell is a fantastic device. It offers a lovely, premium design that is more appealing than its competitors and it brings with it a great feature set as well as excellent image and video quality. A competitor to the Ring video doorbell is finally available in the UK. Say hello to the Nest Hello. Nest claims Hello is the first video doorbell able to both detect people and offer facial recognition, but its features aren't limited to just letting you know when grandma is at the door: there's also two-way communication, quick responses for the delivery man and compatibility with Google Assistant-enabled speakers. Nest Hello vs Ring Video Doorbell vs Doorbell 2 vs Doorbell Pro: What's the difference? But can Nest Hello walk the walk as well as talk the talk? We've had one installed to see if it's the new top buy in the connected doorbell market. The Nest Hello video doorbell has a slim, sleek and sophisticated design with a black shiny face and a plastic white body, keeping in line with the rest of Nest products. Hello is larger than the average doorbell, but significantly smaller and more discreet than the likes of the Ring 2. The Nest can be installed on the side of a door using the included wedge or on the door itself. We originally opted for the centre of our door to give us the best possible view from its camera, but after replacing our front door, we moved the Hello to the side of the door on the brickwork with the wedge. Both positions were great and we rather like its standout glossy finish. At the bottom of the oval-shaped doorbell is the main button, which has an LED ring around it which lights up blue when pressed, while a glass-covered camera lens is positioned at the top with an LED status light above it. Nest Hello is a wired device so there is no need to worry about recharging any batteries, but if there isn't currently a wired doorbell available from which to steal existing wires, things are a little complicated when it comes to installation. We didn't have a wired doorbell previous to having Nest Hello, but we did have a power socket close to the door that the installer was able to use. Installation in our case took around two hours and resulted in a wire originally running from the centre of the inside door to three wall-mounted boxes. Since changing doors, the wires now run on the inside wall, making for a neater finish. These boxes are for powering the doorbell, an electronic chime, and the transformer. Thankfully these boxes are covered by a piece of furniture in our home, but it's worth noting that while everything looks fabulous from the front, behind the door is less pretty. For those with a wired doorbell, installation should be relatively straightforward. But for those without, there is a definitely a reason Nest recommends professional installation - and we'd advise opting for the Hello with the installation included for the extra £100. It's a lot of extra money and one of the product's biggest downsides, but if you want the goods then you'll need a pro with extensive electrical knowledge. Nest Hello has a HD camera with a 160-degree field-of-view, making it nice and wide-angle, so anyone approaching the door can be seen from head to toe, or head to waist when they are on the doorstep ringing the bell. We're able to see anyone approaching down the path itself as well as the naughty postman who always takes a shortcut across the lawn and this is still the case even after moving the position to the side. Results are excellent no matter what time of the day, too. The HDR imaging gives a clear and distinguished picture even when there are shadows, while night vision provides a detailed UV image even when it's pitch black outside. Hello will record continuously (24/7) so it's always possible to go into the Nest app and see a live stream of the front of your home. There's relatively little lag in live streaming. For more than a three-hour history, however, a Nest Aware subscription is required, which can become rather costly depending on the tier you select: £4/month gets five days' footage; £8/month gets 10 days; £24/month gets the full 30 days. There are three video quality settings available within the Nest app, which can be selected based on bandwidth and how much data you wish to use. You'll need to be within Wi-Fi range otherwise the doorbell becomes fairly useless. We had our Hello set to the middle quality which offered very clear footage. The 8x digital zoom works well at this setting too, though we'd recommend switching to higher quality if you want a clearer zoomed image. We did find switching the quality to low turned our Hello offline for some reason. Hello picks up sound and motion very well and the app interface is much more user friendly than others we have used. Alongside great picture and video quality, Nest Hello offers both person detection and facial recognition, though the latter is only available with a Nest Aware subscription (as it is on the Nest cameras). Person detection is available on the Ring Pro, but not facial detection, which is where the Nest steps things up a notch. In order for facial recognition to work, Hello has to be taught who is who over time, but once it has a few confirmed images of a person collected in the library and a corresponding name, the app (or Google Assistant-enabled speakers if you have this feature turned on) will announce when grandma, grandpa, the postman or your neighbour is at the door. For those faces that are familiar but still require extra confirmation, Hello notifies you that a familiar face is at the door; for those faces it doesn't recognise, it says an unfamiliar face is at the door. All the images collected of people are stored within the People section of the Nest app, which is where users can confirm faces. Sometimes the same face is identified differently, so you'll need to manually merge these into one during the learning process. Hello took around a week to learn and be confident in telling us our partner was approaching the door, but once this virtual set of eyes gets it, it gets it right most of the time. The system can be confused though. A friend intentionally pulled faces in an attempt to get a better collection of images into their file, but Hello didn't acknowledge them at all. In another instance Hello confused our partner's brother with our partner, but we're putting this down to it needing more time to learn. Other features include HD Talk and Listen, allowing homeowners to speak to whoever is at their door, irrelevant of whether they are at home or not. Tapping the microphone button in the app allows you to have a clear conversation with the person at the door - but a good connection is required, otherwise there is a delay and the conversation doesn't flow all that well. Other options when the doorbell is pressed include ignore and Quick Responses. Quick Responses provide a choice of three pre-recorded voice messages that you can select to be played to visitors. Sadly you aren't currently able to customise these responses - something we'd love to see made possible in a future update. Nest Hello sends a notification to the Nest app when someone either approaches the doorbell or rings it. The chime will sound for the duration you have it set, though there is also a feature called Quiet Time. This feature allows you to select a Do Not Disturb time-frame of between 30 minutes and three hours, whereby you'll only get a notification on the app when the doorbell is pushed, rather than the chime too. We've seen this on other video doorbells in the past, but it is a useful feature to have. When activity is recognised by Hello you'll receive an app notification. It's possible to customise which notifications you want to receive and when, avoiding being bombarded by excesses if, for example, you are at home. Receiving a notification allows you to tap the video for real-time interaction, while expanding the image shows an even wider angle. If you miss a live interaction then you can view a history of activity in a features called Sightline, enabling you to tap on any of the videos to see who came to the door and when, as well as see a run-through of all the sounds, motion and activity that's happened in front of Hello throughout the day and night. Nest Hello is the most advanced video doorbell you can buy right now. Not only is its smaller-scale and more premium design more appealing than its competitors, it also brings a wider and more powerful feature set with it: great facial recognition and video quality, all wrapped into an ace user interface and app package. It isn't perfect though, with its biggest downfall being the potential cost. The doorbell is a pricey bit of kit on its own, but even more so when you consider the cost of installation (£100 when bought through Nest) and the Nest Aware subscription. Even at the base subscription level you'll need to add an extra £40 a year to get a few extra days worth of footage stored in the cloud. Hello Nest Hello, welcome to the video doorbell party. You might have been a bit late - but you're the guest we've been waiting to see. Ring has a head start in the video doorbell industry, with its second-gen model a great device indeed. It's cheaper to buy than Nest, the subscription costs are far less, too, but it's not as pretty nor as feature packed.